Charles I was beheaded on a scaffold outside the Banqueting House at Whitehall on Tuesday, 30 January 1649, and was buried in a vault under the Quire of St George’s Chapel, Windsor, on 7 February 1649. This much is accepted as fact. However, controversy surrounds the fate of the King’s body (and, in particular, his head) between his execution and burial. According to one account, the decapitated body and head were placed in a coffin which lay ready on the scaffold and which was immediately carried into a room in Whitehall Palace. There, according to Lord Clarendon, the body “was exposed for many days to the public view, that all men might know that he was not alive”. One of those admitted was Sir Purbeck Temple who claimed to have seen “the head of the blessed martyr’d King lie in a coffin with his body, which smiled as perfectly as if it had been alive”. After several days the body was transported to St James’ Palace, pending a decision from Parliament where the King should be buried. Several contemporary accounts suggest that the body was embalmed at Whitehall before it was removed to St James’ Palace, however there is a discrepancy as to when and where this was done. One source claimed that the embalming took place on the large table in the Dean of Westminster’s kitchen immediately after the execution, whilst Lord Clarendon recorded that the body was embalmed at Whitehall after it had been on display to the public. Most agree that Thomas Trapham, Surgeon–General to the Parliamentary Army, was the man appointed to the task, although fellow physician, George Bate, in a written account of the death and embalming of Charles I, described him only as a “rascally quack physician”. 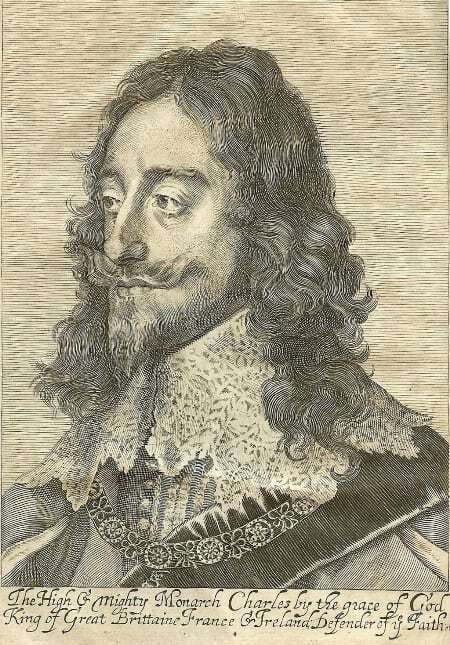 The head of Charles I, which is pictured in this engraving in a book in the Chapter Library, A large declaration concerning the late tumults in Scotland, 1639 [SGC RBK E.68], is iconic. But was it reattached before burial? William Wadd, a contemporary, claimed that the order issued to Trapham to embalm the King’s body included a specific instruction to sew on the head. This practice was not unknown for victims of decapitation in the 17th century. However, no official documentation has survived to confirm this. Local tradition in Windsor, that the King’s head was reattached to the body on the great table in the Deanery at Windsor, where the coffin rested briefly after its arrival at Windsor Castle, is equally undocumented. We are therefore forced to resort to a report made over a century later, in 1813, by Sir Henry Halford, Physician to the King and the Prince Regent, on the opening of the burial vault containing Charles I’s body at Windsor. On the instruction of the Prince Regent, the coffin of Charles I was opened on 1 April 1813 to establish whether the body within it was, indeed, that of the deposed King. Those present, the Prince Regent, the Duke of Cumberland, Count Munster, the Dean of Windsor and Benjamin Stevenson, witnessed Sir Henry Halford unwrapping the cere-cloth which enveloped the whole body and removing the King’s head. Halford wrote: “when the head had been entirely disengaged from the attachments which confined it, it was found to be loose, and, without any difficulty, was taken up and held to view”. However, even this account is not conclusive – the head might have been “loose” because the sewing thread had rotted or because it had not been sewn on: Halford did not specify. He was more interested in the fact that the head had been severed from the body by “a heavy blow, inflicted by a very sharp instrument”. This, according to Halford, “furnished the last proof wanting to identify King Charles the First”. The body and severed head were duly replaced in the coffin, with exception of a few biological samples retained by Halford for further testing, and the vault under the Quire was closed. Since then only one further reopening has been recorded – in 1888 when the relics removed in 1813 were replaced in the vault in the presence of the Prince of Wales. The unresolved issues regarding Charles I’s body do not end there. In a recent book on St George’s Chapel, consultant archaeologist Tim Tatton-Brown concludes that the black marble ledger stone placed in the Quire by order of William IV to mark the burial place of Charles I and Henry VIII is incorrectly sited. Recent research suggests that the claim made on the 1837 ledger inscription that Charles I is buried “beneath this marble slab” is incorrect: in fact the vault that bears his coffin lies some four metres to the east, nearer the High Altar. In death, as in life, Charles I continues to divide opinion. George C. Peachey, ‘Thomas Trapham—(Cromwell’s Surgeon)—and Others’, Proceedings of the Royal Society of Medicine, August 1931 24(10): 1441–1449.